In the middle of the 1800s, the invention of the typewriter revolutionized the way Americans communicated. The new device allowed for the production of correspondence at previously unimaginable speeds. Though this transformation helped foster more detailed and voluminous exchanges of information, early typewriters were cumbersome and bulky pieces of machinery. In 1892, a patent by a Stamford man not only brought portability to typewriter design, it also helped foster the growth of typewriter manufacturing in Connecticut well into the 20th century. 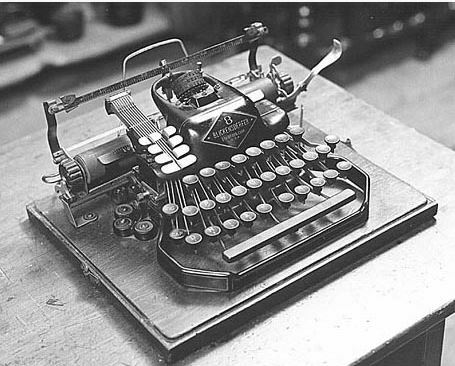 On April 12, 1892, the US government awarded a patent to George Blickensderfer for what many consider to be the country’s first truly portable typewriter. Blickensderfer, who founded the Blickensderfer Manufacturing Company on Garden Street in Stamford just three years earlier, utilized his now patented design to grow his company into one of the world’s largest typewriter manufacturers. The principle of Blickensderfer’s design was a method of revolving type that greatly reduced the number of parts required to produce his machine. His lightweight model became so popular that he began offering customized versions capable of typing in different styles and languages. Blickensderfer died in 1917 and the L.R. Roberts Typewriter Company of Stamford purchased his company just three years later. 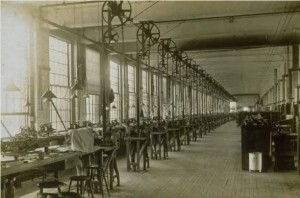 By the time of Blickensderfer’s death, however, typewriter manufacturing was a staple of Connecticut industry. 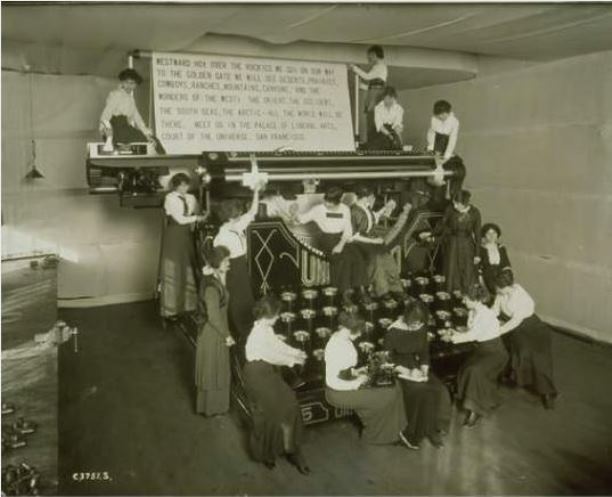 In 1913, while home to only seven of the 73 typewriter manufacturers in the country, Connecticut’s operations were so massive that they employed 5,423 of the nation’s 14,963 typewriter workers. By 1927, the state had 29 manufacturers and over seven thousand workers. These manufacturers spread out across the Connecticut landscape, bringing prosperity to their various locales throughout the state. 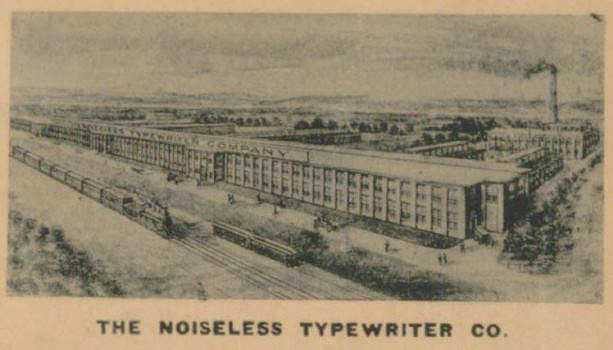 One of the more innovative manufacturers was the Noiseless Typewriter Company of Middletown, Connecticut. Incorporated in January of 1909, the company sought to combat the discordant clattering found in office spaces with a quieter version of the typewriter. 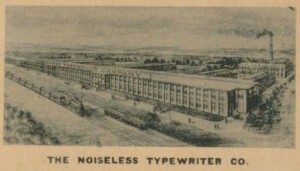 Taking over the factory previously operated by the Eisenhuth Horseless Vehicle Company, the Noiseless Typewriter Company was soon producing up to twelve thousand typewriters per year. In 1927 they merged with Rand Kardex to form the Remington Noiseless Typewriter Corporation—Middletown’s largest employer—but labor strife in 1936 ultimately changed the direction of the company away from typewriter production. Another prominent location for typewriter manufacturing was the city of Hartford—home to, among others, a pair of the most successful companies of the era. In 1901, the Underwood Typewriter company relocated to Hartford. Underwood produced some of the most iconic typewriters of the early 1900s and proved a favorite among authors and reporters alike. Following less than a decade behind Underwood, the Royal Typewriter Company moved its operations from Brooklyn, New York, to a five-acre manufacturing facility in Hartford. The first Royal typewriter, the Royal Standard, actually differentiated itself from all other models by having a “flatbed” design instead of the traditional “upright” construction. The company’s success allowed it to move into the portable typewriter market in 1926. As a way to promote the durability of Royal Typewriters, Royal president George Smith bought an airplane in August of 1927 and dropped over eleven thousand of his typewriters to customers by parachute—only damaging ten. During World War II, Royal ceased typewriter production to make guns, ammunition, and airplane parts, but by February of 1950 the company had entered the emerging electric typewriter market. Like many Connecticut companies, Royal took advantage of new overseas markets to open a factory in Holland in 1953, and the following year the company merged with the McBee office and accounting supply company. The company eventually changed its name to Royal Consumer Information Products, Inc. and moved its headquarters to Somerset, New Jersey. Like many stories from Connecticut’s industrial past, typewriter manufacturing is often under appreciated for the role it played in shaping the modern world. As was the case with bicycles, clocks, brass, and numerous other manufactures, typewriters kept Connecticut at the forefront of northern industrial development for nearly a century. An examination of its expansion and contraction speaks to the influences of consumerism, urbanization, and globalization on Connecticut’s economy and how these changing forces ultimately transformed the state’s industrial identity. “Blickensderfer Typewriters.” Stamford Historical Society, 2014. Link. “Catalog Record of John Underwood Correspondence, 1904-1922.” Connecticut Historical Society Library Catalog, 2014. Link. Historical Perspectives. “Documentation: Remington Rand Facility, 180 Johnson Street, Middletown, Connecticut.” City of Middletown, March 2010. Link. Going, George G. Patent Number 1,471,152 - Typewriting Machine. US1471152 A. Middletown, CT, issued October 16, 1923. Link. Blickensderfer, George C. Patent Number 472,692 - Type Writing Machine. 472,692. Stamford, issued April 12, 1892. Link. Blickensderfer Manufacturing Company. The Blickensderfer Mf’g Co., Stamford, Conn., U.S.A. Stamford, CT: The Company, 1920.